You can change your location's hours as needed. Change a time range, and/or specify the appropriate days of the week as needed. Times - Type the Start and End time of the range (for example, 8:00AM to 12:00PM). Days - Select the days of the week for which this time range applies (for example, Monday through Friday). Repeat steps 2 - 4 for any other time ranges that you want to edit. 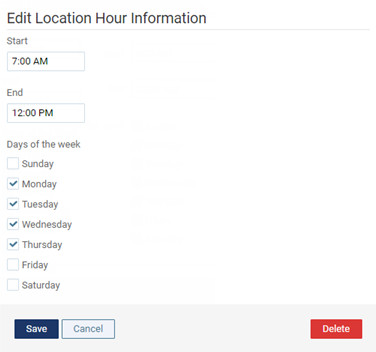 When you are viewing the overview of the weekly schedule on the Location Hours page, gray slots indicate when the office is closed, and white slots indicate when the office is open.